Mindfulness training helps stabilize experience by increasing awareness of the body as well as reducing unproductive mental elaboration of painful situations. In their paper, Farb et al. consider the role of the insula in the beneficial effects of mindfulness training. 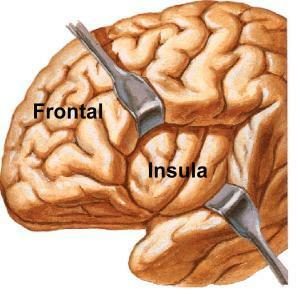 The posterior portion of the insula seems to serve as the primary interoceptive cortex, which registers internal bodily sensation. The anterior insula has an important role in determining whether attention is directed internally towards the body or externally towards the world. The paper shows that only 8 weeks of mindfulness training helps makes internal sensation more a part of the trainees habitual attentional stance. It does this, the data suggests, in part by increasing the functional connectivity between different parts of the insula. In many places we have used text passages out of order to support the narrative flow. For references, please refer to the original paper: Norman A.S. Farb et al. Mindfulness meditation training alters cortical representations of interoceptive attention, Soc Cogn Affect Neurosci (2013) 8 (1): 15-26. Extracted with permission from Oxford University Press. This post, like the last one, resonates in an interesting way with Thomas Metzinger’s article on out of body experiences, in which one senses one’s own body more from an external perspective. The propagation of interoceptive signals from the posterior to anterior insula makes it an intriguing candidate mechanism for investigating training-related plasticity in interoceptive representation. Behaviorally, training appears to improve interoceptive accuracy for tasks such as heartbeat detection, suggesting possible neuroplasticity in an interoceptive representation network. [W]e used functional magnetic resonance imaging (fMRI) to examine the effects of MT on the cortical representation of IA. We contrasted an untrained, waitlisted control group against individuals who had recently completed the 8 week MBSR training program. To measure IA recruitment, neural activity associated with breath monitoring was contrasted against two visual EA tasks, controlling for the common attentional requirements of maintaining sensory awareness and suppressing distraction. Using this paradigm, we were able to evaluate whether the representation of IA, including its specific propagation through the insula, was altered as a function of MT. The formal meditation practices included breath monitoring, body scans (the progressive direction of attention to different parts of the body) and diffuse direction of attention to sounds, thoughts, feelings and bodily sensations. Participants were trained on three experimental tasks, breath monitoring (‘Breathe’), cognitive suppression (‘Suppress’) and working memory maintenance (‘Maintain’) prior to fMRI data acquisition. For the Breathe task, participants were asked to attend to all sensory aspects of their breath (i.e. in the nose, throat, chest and diaphragm), without intentionally altering their respiratory rhythm and with their eyes open. In the event of mind-wandering, participants were asked to calmly return their attention to the breath. For the Suppress task, participants were asked to read foveally presented words while inhibiting any cognitive or emotional response, keeping their minds blank while attending to the word stimulus. For the Maintain task, participants were asked to press a key whenever a word was repeated in a visually presented sequence (a ‘1-back’ task). Eight gray matter regions of interest (ROI) were selected according to the anatomical divisions of the insular gyri, ranging from the anterior accessory gyrus, through the short and long gyri of the middle insular, and into the short and long gyri of the posterior insula. To index primary interoceptive cortex, we identified a right posterior insula region related to variations in respiratory rate between task blocks. Referred to as the 'interoceptive seed' in the present study, we observed in prior work (Farb et al., 2012) that this posterior insula region was uniquely associated with variability in respiratory rate during IA, and this association was significantly stronger during IA than during EA. 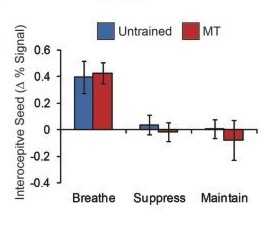 This interoceptive seed region was also strongly responsive to IA [breath] over EA [suppress or maintain] in both [meditation trained (MT) and untrained groups]... (Figure 4a), serving as a common region wherein attention modulates the representation of the interoceptive signal. [i.e. attention independent] and dependent PPI [psychophysiological interaction or] functional connectivity. 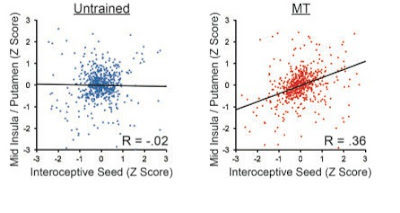 Independent of attention conditions, MT was associated with higher functional connectivity between the interoceptive seed and the right middle putamen, extending into the short gyrus of the anterior insula, [as indicated in] Figure 4b. 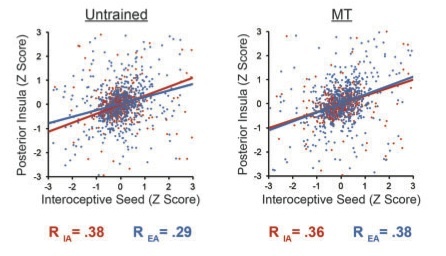 Condition-dependent connectivity also observed across groups in the ...posterior insula just rostral to the primary interoceptive seed, with higher connectivity in IA relative to EA. 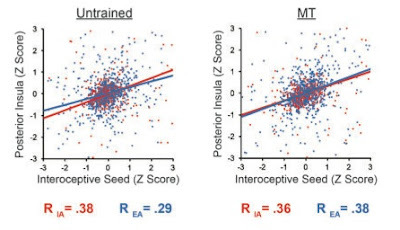 Subsequent analysis...suggested that the untrained group elevated insula connectivity to match condition-independent connectivity levels observed within the MT groups Figure 4c. Thus while untrained participants were able to voluntarily invoke IA to promote connectivity of interoceptive signal from the primary interoceptive cortex towards more anterior sensory intergration regions, MT participants appeared to possess this increased connectivity regardless of task. Such a finding is consistent with a...goal of MBSR practices, to provide individuals with a consistent ‘on-line’ representation of body awareness even in the face of exogenously cued stressors, weakening conceptual knowledge with competing knowledge of constantly changing interoceptive sensations. [Moreover] In whole brain analysis, the DMPFC [dorsomedial prefrontal cortex] demonstrated a unique interaction between group and attention. 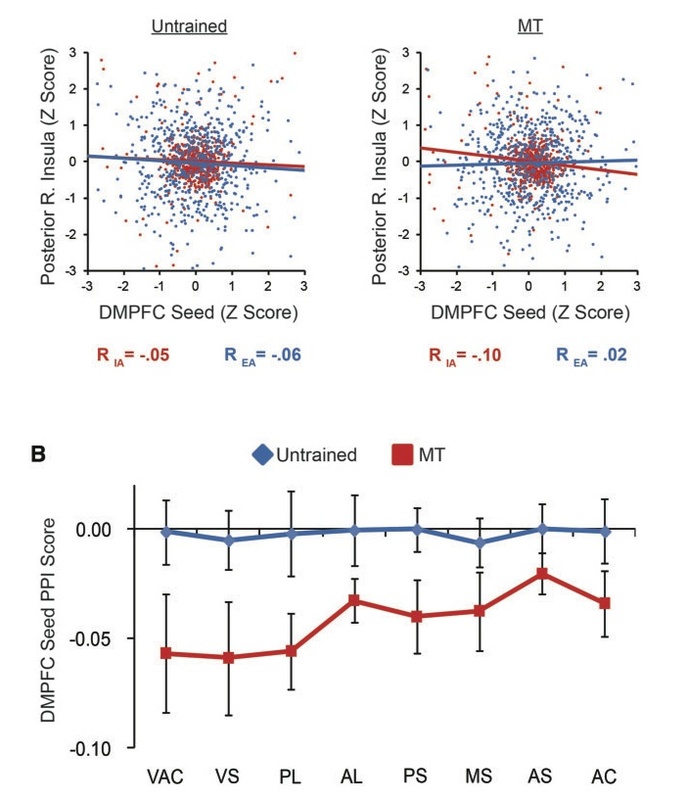 DMPFC activation has been related to the deployment of focal attention, acting as an index of of executive processes that are present both during both effortful task-related concentration and during unintentional mind-wandering. Reduced IA related activity [was observed] in the MT but not the untrained group. (Data not shown). AS, anterior short gyrus; AC, accessory gyrus. 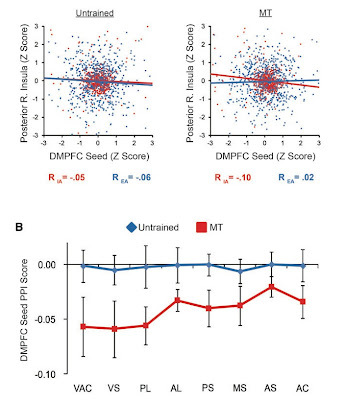 The present findings suggest an important role by which DMPFC facilitates MT effects, promoting reduced conceptual cortical activity and enhanced interoceptive connectivity. DMPFC deactivation could therefore be one neural mechanism of attentional control enhancing interoceptive representation following MT. MT was also associated with modulation of interoceptive signal amplitude. 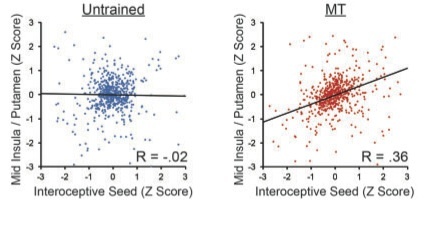 While the primary interoceptive region did not demonstrate increased 1A-related recruitment in the MT Group, MBSR practice compliance was associated with increased attentional modulation of posterior insula cortex, consistent with experience dependent modulation of primary interoceptive cortex. Figure 6 b. [Conclusion]: The present study investigated whether IA practice through MT resulted in functional plasticity in interoceptive representation cortex. We were ... able to demonstrate two novel mechanisms by which MT may modulate the neural propagation of interoceptive signal from the posterior insula during IA: (i) MT may promote greater functional connectivity between the posterior insula and anterior insula gyri, leading to greater anterior insula activation and (ii) MT may simultaneously reduce DMPFC recruitment and strengthen negative DMPFC/insular connectivity.